Romaniascout – Romanian Energy News – How much will gas prices increase? Institutions established to “help” the liberalization of gas market; studies paid with large amounts of money to show “What and How to do it?”; famous consultants making statements in public, depending on “Who and How Much pays?”; optimistic authorities giving pessimistic expectations. However, taking into account all these behaviors, what happens to gas prices? In 2015 the Government of Romania approved a new price deregulation schedule for gas from domestic production intended for the residential consumers, providing for a slow increase in this price to the market price level. The recent years brought multiple cases of change of the gaseous fuel, integrally or partially (for example, gas is maintained exclusively to align consumption peaks overnight) at the level of several consumers. In the next years, the potential discrepancy between the cost of using natural gas and the cost of using other fuels will determine the increase in fuel prices that substitute the gaseous fuel. Analyzing the evolution of the correlation between gas prices and energy demand reveals that within a decade a gas price increase by approximately USD 100/TCM determined a decrease in gas consumption by around 5bcm. 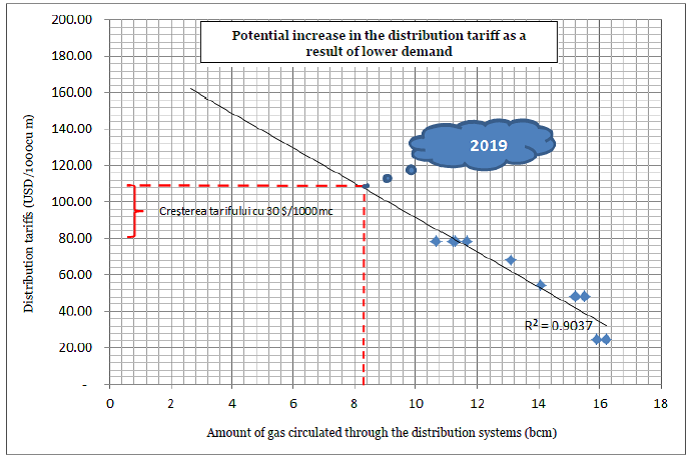 We believe that in the next 5 years the deregulation process and the behavior in supporting the tariff for services in the gas sector will determine a decrease in consumption to half the amount reduced in the past decade; extrapolating historical data for 2019 shows that gas consumption could be about 10bcm/year, respectively we estimate that the amount to be transported would be of approximately 9.2bcm/year and the distributed amount of approximately 8.5bcm/year. Considering the amount to be transported of 9.2bcm/year and maintenance of the current situation (the lack of a proper strategy), the transmission tariff will have to increase in order to cover the costs by approximately USD 12.5. Note – The new transmission routes proposed by TRANSGAZ are not taken into account. An important cause of the size of transmission tariffs is due to the low capacity of network usage. 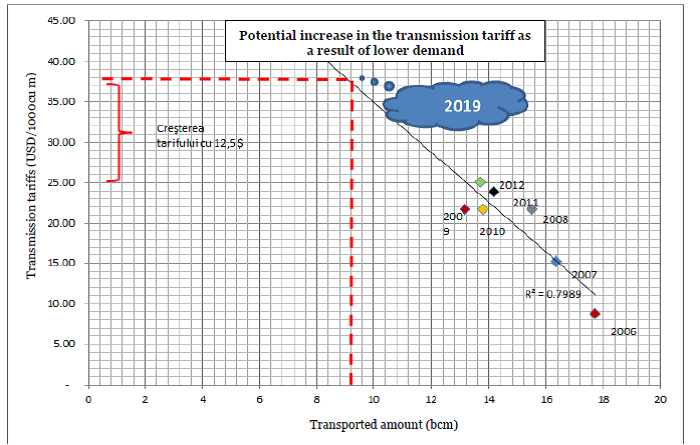 Costs in the transmission activity being relatively constant and slightly dependent, in Romania, on the transported amount, a decline in the transported amount (of the usage degree) brings the need to increase the transmission tariff to obtain enough incomes to cover the existing costs. Considering the amount to be distributed of 8.5bcm/year and keeping the current situation, determines the increase in the distribution tariff, in order to cover costs (an increase by around USD 30). The same situation is met in terms of distribution tariffs. Costs in the distribution activity are relatively constant and slightly dependent on the distributed amount, thus the decrease in the distributed amount will determine the increase in the distribution tariff to obtain enough incomes to cover the existing costs. Changing the market structure, both in terms of the annual demand and the daily and hourly demand, the occurrence of the commercial role of underground storage facilities has determined costs for their adaption to the new requirements. Thus, for the end-consumer, the price increase calendar will bring not only the increase in gas from domestic production, but will also bring, in the current situation, an increase in the transmission, distribution and storage tariffs. Not stopping this spiral and the lack of strategic intervention only makes the price to the end-consumer to escalate to dangerous values. 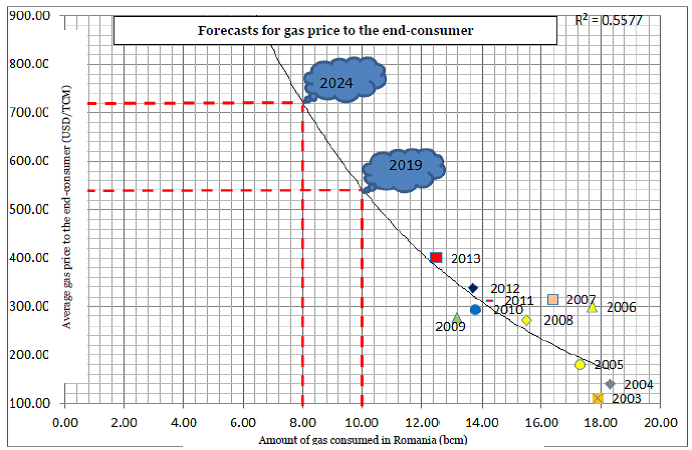 Following the presented analyzes, at the end of the domestic gas price deregulation schedule, but not only because of the schedule, we estimate an increase in gas prices to the end-consumer by 40% and a decrease in the amount of gas consumed in Romania by around 30%. Note: All analyzes are made based on hypothesis and public information, being made in the conditions of keeping the current situation and without a proper energy strategy.